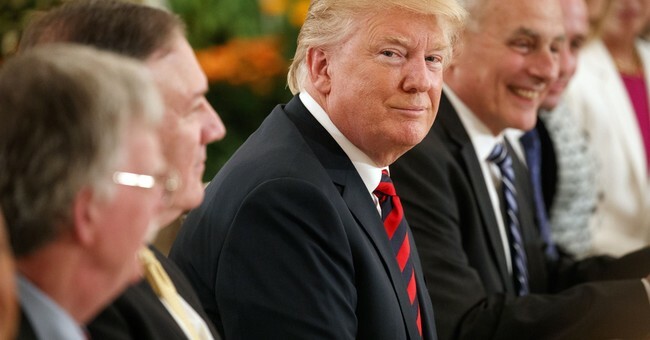 The media and public hysteria surrounding President Trump is masking something extraordinary – we may be entering a new American age of peace, prosperity, and innovation, the likes of which has never been seen before. We will let history judge President Trump's tweets, rhetoric, and personal demeanor. The results of his policies are what are important – and they are decisively positive thus far. America is turning away from the reckless economic policies that led to the financial tsunami of 2007-2009, away from the Socialist-Orwellian responses to it, and away from 30 years of Middle East wars that produced death, destruction, and debt. These pivots are favorable for America, as well as the global community. The broad-based U.S. tax cuts are reigniting America's economic engine, the main driver of the global economy. Remember the Obama era talk of the new normal whereby a mature economy can't grow faster than 2 percent? Rubbish. Thousands of business-stifling government regulations are being discarded, further reigniting America’s economic engine. Most of these regulations are in effect legislation, put in place by unelected bureaucrats with little business or common sense. America is re-affirming its commitment to the Rule of Law and ending the lip-service paid to anarchists and rioters (Occupy Wall Street, Ferguson, Antifa). The constitutionally defined legislative and judicial processes for challenging and repealing existing laws remain alive and well in civilized society. Russia is a severely diminished bad boy with an economy barely 7% of that of the United States. Aside from launching nukes (and routine election tampering around the globe), Russia doesn't have the resources to challenge America. The media's incessant wolf crying is just that. China Inc. is open for business and knows the best way to prevent internal unrest and revolution is to operate at full capacity. China may eventually overtake the U.S. economy, but it won't be via sabotage. Would China dare to harm its primary customer, thus reducing sales, idling workers, and increasing risk of revolution at home? Certainly not. Remember that America’s imports from China are about 4% of China’s GDP, whereas, America’s exports to China are less than 1% of America’s GDP. Who holds the upper hand? America is finally playing hardball in trade negotiations – demanding a fair and level playing field with trading partners. Other nations (including China) need to be in our markets far more than we need to be in theirs. This gives America significant negotiating power, something our last two presidents failed to grasp. North Korea will either cut a deal and open up for business (at the behest of China), or America will put it in a contained black box. The weak and ineffective 25 years of paying nuclear-ransom is over. The bad boys of the Middle East are finally being handled properly. America and allies are quietly annihilating the stateless evil doers (ISIS, Al-Qaeda, Taliban, Hezbollah, Hamas, etc.) and doing so without deploying the expensive heavy World War II-style military footprint of the Bush’s. Likewise, America is putting the bad state actors (Iran, Syria, Sudan, etc.) back into the contained black boxes where they belong. The Middle East (and oil markets) is being re-shaped by the rise of a new power block that was previously unimaginable – America / Israel / Saudi Arabia / UAE / Egypt. The positive effects of this will reverberate for decades, undercutting Iran and curtailing the psychological power of the Arab Street. The serious business nations are getting back to work – Britain's Brexit from the EU is freeing their hands, Macron is reinvigorating France with capitalist ideas, Germany and Europe are finally addressing their immigration powder-kegs, India is giving stiff competition to China, and Japan and South Korea are growing steadily. The Russell 2000 index of American small cap stocks is hitting record highs, an important lead economic indicator. Likewise, the forward Price-to-Earnings ratio of the S&P 500 index is 16.6, a reasonable if not cheap valuation in a rapidly growing global economy. And commodity prices (with copper now participating) are signaling a powerful growth cycle ahead. All of the above is fomenting a new global business-friendly era with a focus upon innovation – technological, scientific, space-based, and in every other realm imaginable. If these trends hold, the future looks bright indeed. Most importantly, the hysteria surrounding President Trump, coupled with overblown fears of a global trade war, means this new golden era is not yet perceived or priced into the markets. This spells opportunity.